It is helpful during childhood, when parents do send consistent and backed up signals, measures and actions to their children that there are penalties for breaking rules which have been already and clearly articulated upfront. It allows the child to demarcate parameters within which are acceptable and encouraged behaviours - and beyond which are no-nos with reasons and consequences. Concurrent with rules, allowing your child to grow meaningfully is also to give them choices - and for them to realise that there is personal responsibility behind such freedoms. Freedom when put into a context becomes more valued. The world out there can be changed for the better - and parents demonstrate this to their children, not just talk about it. Just the act of visualising various future scenarios can plant the seed in a child's imagination, passion and motivation. 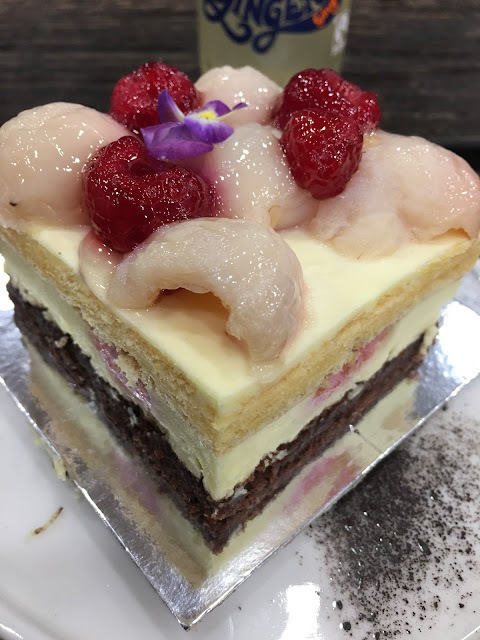 I have had potato noodles, pancakes, marinated meats grilling in front of me and delightful dessert concoctions in the various Korean restaurants and cafes across greater Sydney. Oh yes, I have blocked out the karaoke sessions, bar drinks and yet others more from years gone by. And yet I have not been to the Madang along Sydney's Pitt Street.....what some others refer to as Koreatown! Madang here has nothing to do with Papua New Guinea, as diggers from the Korea front know, but is a Korean term for an inner courtyard in a traditional Korean house set up, and which welcomes gatherings and meet-ups. The new kid on the block has arrived, oh well, for a few weeks by now. Apparently thousands of slices of the iconic watermelon and strawberry cake slices are shelled out every day across Sydney. Now comes the new baby, with luscious and plump lychee yum yums resting on top of a multi-layered concoction, accompanied by the stronger flavours of raspberries. Both fruits, one tropical and the other temperate, seem to symbolise Australia, where Asian meets up with Caucasian, all in a sea of ethnic diversity. Lychee has a more subtle juiciness, but has its unique taste, by which the risks of it being over come by stronger and more acidic bites can occur. This does not happen here, although raspberries are sweeter, but they do have more character. So the choice of both toppings ends in a win win situation. They look pretty as well, the neutral look of lychee being set off by the flamboyant raspberries. I was searching for takeaway coffee and croissants. We looked at the glass shelf display and could find more sweet stuff. The young female staff offered to check with the kitchen if fresh croissants could be made. I thought this was a nice gesture. It reminded me of another person in Brisbane a few days earlier who thoughtfully suggested I could take the complimentary bus coach from the Domestic Terminal to the International one. I had aimed to jump on to the Air train, but she said to me. "You would save five dollars." And I did not have to wait for this bus coach either, it came in as if on cue, as I approached the related stop area. The Stellarossa cafe here at Santos House has an open preparation counter, with a very focused guy concentrating on his stuff. I collected my ham and cheese croissants fresh and direct from him, a refreshing encounter as opposed to other cafes where we do not know how our orders have been made. I have often walked past the Doppio cafe, always bustling in the rush hours, but never stepped in. I had taken note its catch cry - "the local taste of Europe". Doppio has been around sixteen years in Sydney CBD. So on a nippy winter's late morning, after having completed my business applying for a travel visa, I did need a pick me up and so did not hesitate to try the coffee blend. There are teas available as well. The female wait staff was helpful and smiling on approach. Several people were patiently waiting for their orders, which were being made by the barista carefully even with all this potential pressure. There is something of a continental after taste in my coffee, different from the Aussie blends. I still find this wholesome, flavourful and comfortable. The cold weather outside does help to make me appreciate my cuppa more. I have to remind myself that the Doppio coffee is locally roasted. I did not have time for food on this occasion. Internet - Convenient for You or the Provider of Your Services? Feeling the creeps from being snooped upon. Facing the consequences of being a victim of intentional stealing of our data. Realising that we can have disadvantages suffering a personal invasion of our privacy. Knowing that hacking has occurred of our financial and health records. Being tracked of our private movements, and then being taken advantage of with such unauthorised tracking. Having our unique human identity stolen and then misused by fraudulent behaving people. These are just some of the rising nature of ways in which we can be potentially robbed, invaded and have our inner selves gutted. Clear the cookies we incur when ever we use any electronic equipment that has been connected to the cyberspace. If you do this regularly, it is like regularly changing the locks to your physical property - it takes patience and determination, but cna be ingrained as part of the routine of life. What is Uttapam, I asked the friendly guy attending to us at Adithya, a rather unique restaurant in Wollongong serving traditional food from Kerala. I see onion, cheese and mixed fillings for the Uttapam here. He smilingly tells me that Uttapams are pancakes which are thicker than the rather thin batter of Dosas (which I am more familiar with). The fillings are also mixed into the batter before being cooked, in contrast to Dosas, which have fillings separately placed inside the thinner pancakes. Initially I get the impression that Uttapams look like an Indian version of pizzas. What are Vadas? They look to me like doughnuts, but dunked in coconut chutney or hot Sambar! The Dosas, Uttapam and Vadas are available as sides at the Adithya. T's Kopitiam visitedis located at Shop 2, 166 Keira Street, Wollongong NSW, near the corner with Market Street and on the way for vehicles to enter for parking inside the GPT Shopping Centre. Opening hours for lunch are from 1130am to 230pm every day except Mondays. Opening hours for dinner are from 530pm every day except Mondays. Chef Allesandro Pavoni has consistently offered modern Italian culinary dishes which still echo the best of the northern regions of Italy. His base of creativity and culinary delight is also iconic, near the Spit Bridge, in one of lower North Shore Sydney's most coveted spots, blessed by panoramic scenery, easy access from the city centre and yet offering diners a wonderful refuge from city life. I could see the vehicular traffic across the Spit Bridge from our table. My group of three was pretty looking forward to an evening of a surprise menu offering, willingly open to what the Chef had in mind, whim and seasonal produce - instead of being subject to a regularly repeated menu. It was a five course affair, a starter, two mains and closed by two dessert items - the Stressless Sunday Dinner! Luke Barrett is the licensee for this recently opened cafe with a refreshing look, eager staff, welcoming vibes and good coffee blend. Buck Hamblin used to be a well known shoe store and it is delightful the name, iconic of the Illawarra, is retained and revitalised for a new business, a new sector that exudes lifestyle as much as foot gear does. There is a buzz about the place, especially in the morning and afternoon, in a cafe that also has a license to serve social and business alcohol till early evening. What a wonderful combo - a cuppa in the morning and a relaxing wine just before sunset? The primarily white interior decor is contrasted with an eye catching barista stand and counter, purposefully highlighted by vertical stripes. The space is thoughtfully made use of, even the two front narrow sides that once held shoe displays but now providing quiet and private corners away from the main part of the floor. The kitchen is tastefully hidden behind an inside door.